The Out of Office feature in Outlook, also called “Vacation Mode” is one of the best methods to alert people that you are not at work. Enabling the Automatic Replies (Out of Office) feature in Microsoft Outlook 2010 and 2013®, also called Vacation Mode is one of the best methods to alert co-workers or customers that you are away from the Office (vacationing in the Swiss Alps, weekend in Paris etc..) And, you will not be available to check email regularly or if your like me, not at all! Turning on the Out of Office feature is very simple both from the Microsoft Outlook Desktop Client (outlook 2000/2003/2007/2010 & 2013 ) and remotely using the Outlook 2013 Web Access client. Create, edit, and turn off out-of-office messages, set a time range for them to run, and set different messages for different groups. Next, Check the box Only send during this time range to create the Start Time and End Time and Dates for your automatic replies. Your Out of Office Auto-Reply will now respond to anyone who sends you email. 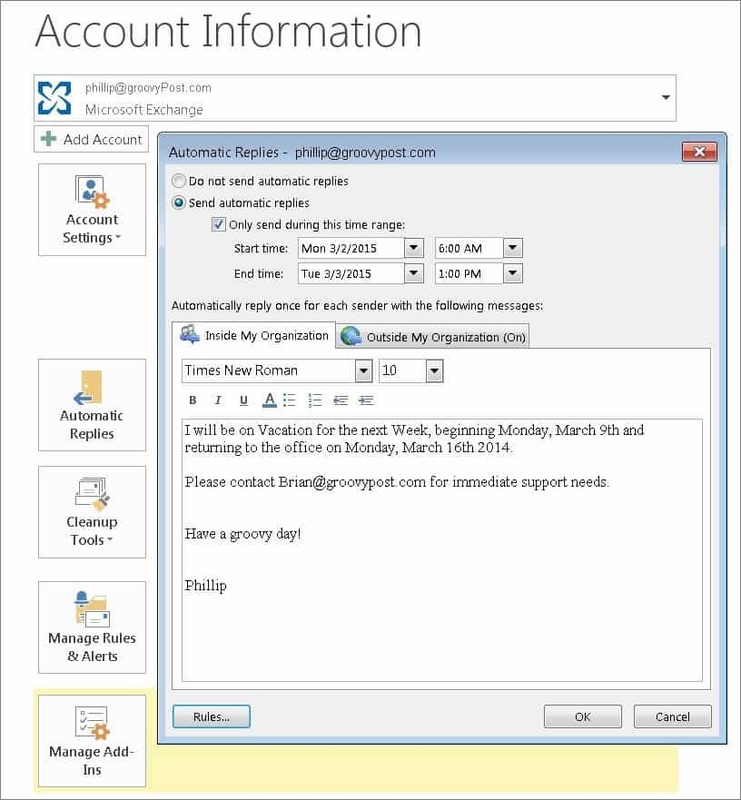 And, so you don’t forget that your Auto reply feature is enabled, the text Automatic Replies will be displayed on the top left corner of your Outlook client as a reminder that your Out of Office Assistant is enabled and working. If you’re still running the 2007 version, read our article on how to enable Out of Office Assistant in Outlook 2007. Sorry its irrelevant here but indirectly related, in Lumia 535, how to disable/delete preinstalled apps like Facebook, games, Lumia movie, Here,. maps etc because I have purchased Lumia 535 only to use for One drive & Office. This feature only works if you’re in an MS Exchange environment. If your Outlook is using an internet based email account, this feature doesn’t show up under “Account Information”. Thanks! That answers the question about my problem. This is definitely very helpful! I’m trying to see if this could also be done via mobile as I have Outlook installed in my iOS. Thanks for sharing this! What if under File- Account info, I don’t have an automatic reply option to click?